Need a Dependable Company to Clean Your Office? Val's Cleaning has provided office cleaning services throughout the area for over 17 years. For a free walk through and cleaning consultation, call (781) 399-4009 today for a written quote and find out just how easy the folks at Val's Cleaning are to work with! We provide services you can depend on each and every day to keep your facility looking its best. Reliable office cleaning doesn't have to be an oxymoron! We understand that finding a cleaning company that will show up on time and completed the work that was agreed to can be time-consuming and frustrating. 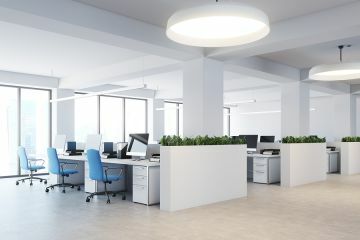 Most businesses have a need to change office cleaning series every 18 months, and the primary reason is that the current cleaning company is not living up to expectations. You need a dependable office cleaning company to keep your offices clean and inviting to employees and clients; not one that requires constant micromanagement. Call (781) 399-4009 for consistently thorough office cleaning, week after week. The thoroughly trained office cleaning staff at Val's Cleaning have been cleaning offices just like yours for over 17 years and they'd love to keep your office sparkling clean too. Your cleaning needs will depend on multiple factors: the number of employees you have on staff, the amount of foot traffic coming through your building, your budget and your expectations for cleanliness. Whether basic weekly cleanings will suffice, or a comprehensive top to bottom cleaning is the bar your clients have set, Val's Cleaning is fully equipped to handle the task. Our detailed, professional cleaning crews are able to complete just about any cleaning project your office requires. When you call Val's Cleaning for an office cleaning quote, we'll schedule a convenient time to meet with you and tour your facility. After we listen to your concerns and learn the scope of the work being requested and understand your cleaning budget, you will be provided with a reasonable cleaning quote. You will probably find that we aren't the cheapest company in the area, because we don't hire the cheapest employees, or cut corners. Val's Cleaning's extensive hiring and training practices yield quality, competent cleaning technicians who have a passion for doing great work. We provide our technicians with the best cleaning products and tools available so that they can work efficiently, saving us time and your money. Call (781) 399-4009 today and discover the value that Val's Cleaning can offer.